In the past weeks I have been inundated with questions about the water crisis in Cape Town and the Western Cape. Here's a summary of the answers to the most frequently asked questions on the topic. Not if the City reaches its supply augmentation targets in time and everyone stays within (and preferably below) the daily use limit of 87 litres per person. Three toilet flushes (27 litres). The above usage totals 80 litres (a further valuable saving of 7 litres per person per day). In short, we have to reduce our consumption and produce more water. If we do enough of both we will make it through the summer of 2017/18. Why have we reached this crisis situation? There are three main reasons: the drought; government response; public response. The drought: We have had three years of below-average rainfall (2015, 2016, 2017). This undermined the assumptions behind the water supply projections. Severe multi-year droughts are very rare in Cape Town (as rare as once in a millennium) according to senior climatologists at the University of Cape Town. Contrary to public perception, these droughts are also extremely difficult to predict. In the same article the UCT climatologists confirm that, for before the winter of 2016 and the winter of 2017, the South African Weather Service predicted a higher chance of wetter conditions compared to the dry season of 2015. The impact of climate change is probably the reason that climate cycles have become so unpredictable. The Public Response: This has been mixed. While some have responded very well and cut back on water usage, others have not. It is crucial that consumers do – and the major onus lies on households in formal suburbs who consume 66% of all water used in the city each day. Cape Town has to reach and remain within the low target of 500-million litres of daily water use, or the crisis will escalate. We have not reached this target yet.The public response to the water crisis also has the potential of driving a new water economy as demand for home storage tanks and grey water recycling systems escalates. We have the potential to emerge from this crisis with a new “water culture” in which people recognise the value of this precious resource. 1. Major water infrastructure – national government. 2. Supply systems for clean water delivery to households – local government. 3. Oversight and support –provincial government. It is crucial to understand this division of responsibility in order to understand the origin and extent of the current crisis. Let me start with Provincial Government (my) responsibility: oversight, monitoring and support. This is not peripheral to the inter-governmental system. It is central. It was OUR oversight responsibility to spot the crisis coming and to take the necessary steps to pre-empt it. From 2009 to date, our government has overseen municipal spending of over R680-million in grant funding for bulk water infrastructure projects, ensuring that none of the Municipal Infrastructure Grant remained unspent. In 2010, during the drought in Eden and Central Karoo, national government provided the funds for major water desalination in Mossel Bay and Sedgefield, while the province ensured that all councils agreed to water restrictions that could be imposed whenever required. Unless a disaster is declared, the Province has no legal right to instruct municipalities to impose water restrictions. It is important to think back on conditions in 2014, a year when our dams were actually overflowing, and we were facing the crisis of electricity load shedding. A drought did not look imminent. The winter of 2015, however, turned out to be very dry. In November 2015, when dams were still 75% full (and despite the predictions of a wetter-than-normal winter season in 2016), we applied to the national government to declare the Western Cape a drought disaster area. Why did we do this when there was clearly no immediate disaster? We did this because we were worried about getting through the long, hot summer that lay ahead, especially in key rural municipalities and agricultural districts. A disaster declaration is necessary in order to legally move budgets from one purpose to another. This would be necessary for the purpose of drilling boreholes, recycling water, and supporting farmers to keep workers in employment and to feed their livestock. The weather service’s forecast gave us no indication that the dry 2015 winter would be repeated in 2016. The National Disaster Management Centre (NDMC) turned down our application for a province-wide disaster declaration. In January 2016, we got the go-ahead for disaster declarations in five Western Cape local municipalities: West Coast District; Central Karoo; Witzenberg; Oudtshoorn; and Prince Albert. 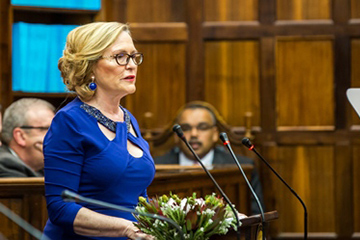 Arising out of this declaration, the Provincial government was supposed to receive R8-million from the national Department of Water and Sanitation, and another R27-million from the national Department of Rural Development and Land Reform. This money has still not arrived, despite numerous follow-ups. In the Province, we diverted R25-million from other projects for water augmentation schemes – drilling and equipping of boreholes, and water demand management campaigns. The provincial Department of Agriculture spent an additional R32-million on fodder relief. In the worst-affected areas, our interventions have been crucial in preventing taps from running dry. By February 2017, the situation was so dire that the Mayor of Cape Town applied to national government to declare the city a local disaster area. Rashid Khan, regional director of the national Department of Water Affairs, rejected the request, saying “although the water situation is concerning, it is not yet at crisis level as has been widely reported; the lower levels in our dam is a concern we can do something about. We still have time for intervention”. Khan was also reported as accusing the City of requesting a disaster declaration merely to acquire funds from the national fiscus for water generation projects. His view was that demand management – rather than supply augmentation – would see the City through. The next day, in the provincial parliament, I sharply criticised Mr Khan and the national minister for this response. Mr Khan’s statements are significant for two reasons – first, they reflect his dismissiveness of the scale of the problem we faced, and second, he acknowledged that funds for major capital infrastructure are the responsibility of national government – as in 2010 when the national department provided capital for two desalination plants in Mossel Bay and Sedgefield. We soon learnt why the department was so determined to avoid another situation in which they might have to fork out money for capital infrastructure. They had none. By that stage the Department of Water Affairs was already R4.3-billion in the red, with R2.5-billion of irregular expenditure and R87-million in fruitless and wasteful expenditure. Controversial projects (such as the Giyani Emergency Project in Limpopo) had ballooned from initial estimates of R500-million to over R3-billion. The national Treasury had refused the department any further bailouts. Surely at that point you realised you were on your own? Yes, we were getting the message. In our oversight capacity, the Province held “drought tribunals” with all 30 Western Cape municipalities, culminating in a Water Indaba to which we invited the national minister, Nomvula Mokonyane, in May 2017. Just prior to the Indaba, we finally received confirmation from the National Disaster Management Centre that the whole province needed to be declared a disaster area, including the City of Cape Town, 19 months after our initial application. However, this declaration was not backed by sufficient funding for the major capital infrastructure required to generate new sources of supply. In assessing the impact of this disaster, you surely have to look back much further than 2015. Water shortages were projected almost two decades ago when the National Water Resource Strategy predicted that by 2025, four water management areas (including the Berg River area which services Cape Town) would be in deficit. What has been done since then? Quite a lot. The City of Cape Town, especially, took this warning seriously. I became Mayor in 2006. By then the City was working closely with the national government Department of Water Affairs, to plan the Berg River Dam, with a storage capacity of 130-million cubic meters (more than 130-billion litres), for the purpose of securing Cape Town’s potable water supply. The dam was under construction throughout my mayoralty and was finally completed in 2009, the year I became premier. The City contributed significant funding to its construction, and is still paying off the loan today. Additional plans throughout the province involved extending the capacity of major dams, including Clanwilliam, Voëlvlei and Brandvlei – projects that have been repeatedly postponed by the national government, because of lack of funds. These were scheduled to be completed by 2017. The project of clearing weirs and repairing canals of the Voëlvlei dam was commenced by national government and stopped without informing us (due to lack of funds) resulting in massive water losses during the past winter. So while the government was failing you were passing the buck to consumers? While we were working on major new supply sources, in good faith, it was also clear that we would have to change the Western Cape’s water culture, especially in the City of Cape Town. Water has traditionally been seen as a free (or cheap), plentiful natural resource. Pipes were leaking, taps often left running, suburban swimming pools filled (and toilets flushed) with drinking water. The City embarked on an intensive pipe-fixing and debt-collection programme, instituting a trickle system for those in arrears; write-off debt if people agreed to fit water meters strictly limiting their supply to the free basic amount per day – or an additional amount they could afford and were prepared to pay for (including my own home). All these steps combined were highly controversial at the time, but very successful. The city’s water consumption has been contained to 1999 levels, with loss-to-leakage better than most of the best maintained cities worldwide – and far lower than any other city in South Africa – despite the fact that since 1999, Cape Town’s population has grown by 50%. But even if we increase water savings, there has to be a new source of supply. What is happening on this front? The City’s current projections, from desalination and groundwater projects, are that between December 2017 and May 2018, between 130-million litres and 240-million litres should be flowing into the system. If the City can reach these targets (despite lack of support for major infrastructure that is the responsibility of national government), and if we can reach the water savings targets, we should get through the summer. But all that hasn’t helped and we are still in crisis. Now what? The City has streamlined its procurement systems even further (which the law and regulations entitle it to do in an emergency). They will have to allow the private sector a much longer pay-back time, in order to make the scheme affordable. And we have to facilitate public/private partnerships to deal with this crisis wherever possible. This is especially important in agricultural communities to prevent widespread job losses and the collapse of key industries. It is equally important in our tourism sector where we have to ensure that visitors to our province save, just like locals. In agriculture, we are working with farmers using technology such as Fruitlook – which is a satellite enabled system – to monitor their water usage in relation to what their crops require. By closely monitoring this, we significantly reduce water use. The Department of Agriculture has also directed over R80-million to subsidising farm wages and for fodder relief. We are in this together and we have to get out of this together. Why hasn’t the province simply taken over this role from the City? What are you doing about hospitals and schools that ARE your mandate? These facilities have been flagged as a priority in our plan. A third of schools in the province already have borehole systems, which are currently being recommissioned and tested to ensure the water quality is up to the standard. Similarly, most of our hospitals already have borehole systems of their own. And with the help of our engineers and geohydrologists, we are servicing them and bringing the water quality up to the standard required for hospital use. Experts are identifying the right places for further borehole drilling. Water tanks and innovative technology (such as aquatrip which turns off the water when not in use so that leaks and wastage cannot occur) are being installed wherever possible. In provincial buildings, we are saving 25,600 litres of water each day by a combination of flow restriction, push taps, replacing water-cooled air-conditioning systems, dual flush technology and waterless urinals. Isn’t it short-sighted to put such great reliance on boreholes and groundwater extraction? What about the risk of draining or polluting these sources? This is a risk and therefore, in the medium term, we will have to look at ways of replenishing groundwater, primarily through managed aquifer recharge that can be done with recycled water or desalinated water. There are many examples of successful similar projects worldwide. And what about the ecological risks of brine effluent from desalinated water? Yes, that is also a risk, especially if brine is discharged in large quantities near the shore line. There are ways of dealing with this, especially when brine is released deep into the ocean, where the risk is negligible. However, this has cost implications that a city or province cannot meet alone. This is part of the major capital infrastructure that is part of the national government’s mandate. What are the implications of Cape Town’s rapid population growth for the water crisis? This is another serious challenge. There is a scientific term known as hydraulic density of population, which refers to the ratio between the number of people and the available usable water. Getting this ratio right is crucial to stability and sustainability. That is why, at the same time as changing our “water culture” to regard water as a precious resource that must be sparingly used, it is equally crucial to increase our sources of supply. But it is going to be very costly. And each sphere of government is going to have to do its job, in line with the constitutional mandate.